The Cash Acme Heatguard® brand has an extensive product range in applications all around the world. The Cash Acme range includes mini-devices for control of temperature to a single electronic sensor faucet, up to large 2" master mixers for control of a whole building. The mainstays of the product line are our 1/2" to 1" under counter and residential distribution mixers. Cash Acme products can solve any temperature control problem, whether at the point-of-use or the heat source, or anywhere in between. Applications Domestic hot water distribution. Sizes Available in several configurations which may include: Threaded, Sweat, SharkBite®, CPVC, Barb, PEX and Compression. Approvals The Cash Acme Heatguard 110-D is certified to ASSE 1017, ASSE 1070 and CSA B125.3. The Cash Acme Heatguard 110-D is listed by ASSE and IAPMO for use in accordance to all U.S. and Canadian plumbing codes. Delivers water at a safe 120°F (49°C) or lower from all outlets, while allowing the heater to be set at a germ-killing 140°F (60°C) or higher which aids in preventing the growth of legionella bacteria in the water heater. The higher tank temperature means that hot water demands can be satisfied longer. Robust, low complexity construction. Every valve is tested for performance prior to shipping. Unique purpose designed adjuster tool minimizes unauthorized tampering with valve setting. Applications Domestic water distribution and radiant heating systems. Approvals The Heatguard® 110-HX is certified to ASSE 1017 and CSA B125.3 and is listed by ASSE and IAPMO. The 110-HX temperature actuated valve mixes hot and cold water to deliver reduced temperature hot water. 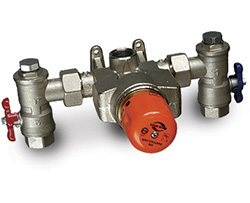 The valve offers a high flow rate which reduces system pressure losses, and robust, low complexity construction. An adjustable and lockable handle prevents tampering. The extended outlet temperature range- up to 176°F (80°C), makes the 110-HX ideal for heating system applications. Applications Large domestic and standard commercial water distrbution systems. The Heatguard® 115-D is intended for installation at the water heater to distribute controlled temperature water throughout a hot water system. For large domestic and standard commercial water applications, the 115-D offers the same reliable protection of the 110-D, but on a larger scale. A fast acting, high quality thermostatic element senses the outlet water temperature and reacts to maintain a stable delivery temperature even under changing flows or variations in supply temperatures. 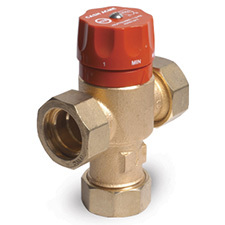 The valve also greatly reduces the outlet flow in the event of a cold water supply failure. The adjusting handle can be locked at a desired temperature or function in an adjusting mode. It is clearly marked to indicate the direction to turn to achieve hotter or colder water temperatures. The valve delivers water at a maximum of 120°F (49°C), allowing the heater to be set at 140°F (60°C) or higher, thus providing a greater effective volume of hot water and reducing the chances of legionella bacteria growth in the water. The valve flows 30 gpm at 45 psi, making it suitable for larger residential and commercial installations. Applications Large heating systems. The Heatguard® 115-H has an outlet temperature range extending to 140°F (60°C) and a flow rate of 30 gpm at 45 psi, making it ideal for use in large heating systems. It is also suitible for any installation requiring the delivery of reduced temperature hot water. Approvals The Heatguard® 115-H is certified to ASSE 1017 and CSA B125.3, and is listed by ASSE and IAPMO. The 115-H features a robust design based on the expertise gained from years of experience in the design and manufacture of safety valves. The 115-H incorporates a thermostatic element that senses the outlet water temperature and reacts to maintain a stable delivery temperature. In the event of a cold water supply failure, it reduces the flow to a tickle. The adjusting handle is clearly marked to indicate the direction to turn for hotter or colder water temperatures or it can be locked at a desired temperature setting. Every valve is tested for performance on an automated testing station during the assembly process. Applications Individual faucets and electronic faucets. Approvals The Heatguard® 145 is certified to ASSE 1070 and CSA B125.3, and is listed by ASSE and IAPMO. The 145 is a mini point-of-use thermostatic mixing valve. It provides stable operation at flow rates as low as 0.5 gpm, or as high as 5.5 gpm. The valve also reduces the outlet flow to a trickle in the event of cold water supply failure. 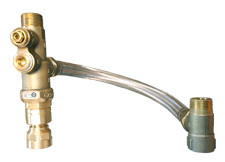 Inlet connections are typical supply line 3/8" compression for 3/8" OD tube or flexible hose with integral connectors. The 3/8" NPT female thread on the outlet allows adaptation to any connection type. Compact design, easily fits under or behind a single basin. Applications Commercial Point-Of-Use. Supply of controlled temperature hot water directly to showers, lavatory faucets, electronic sensor faucets etc. Approvals The Heatguard® 160 is certified to ASSE 1069, ASSE 1070 and CSA B125.3 and is listed by ASSE and IAPMO. "Next generation" thermostatic technology provides optimum water temperature control. Long life and scale resistance ensured by use of high quality engineering polymers and inherently scale resistant design. Every valve is extensively factory tested. Adjustable from 95°F – 115°F (35°C – 46°C). Applications Point-of-use, higher level of protection. Intended to supply controlled temperature hot water to outlets such as a tub or basin in a nursing home or lavatory faucets in a public place. Approvals The Heatguard® 160 is certified to ASSE 1069, ASSE 1070, and CSA B125.3 and is listed by ASSE and IAPMO. Each is complete with service fittings on each inlet. The fittings have a 1/2" female inlet thread and connect to the base valve via union connections. 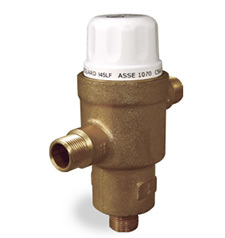 The valve reduces the outlet flow to a trickle in the event of cold water supply failure. Every valve is tested for performance on an automated testing station prior to shipping. Accurate temperature control even under varying supply conditions. Applications For shower, tub or faucet spouts to act as a "hot water fuse" to shut off flow of water if it reaches 120°F (49°C). Sizes Available to suit shower heads, faucets (male and female thread) and tub spouts. Approvals The Heatguard® TAFR are certified to ASSE 1062, CSA B125.3 and NSF-61 and are listed by ASSE and IAPMO. Thermal element senses high temperature water and shuts off flow to protect user. Device will only reset when water temperature drops to a safe level. Applications Commercial and industrial plant rooms. Master control of the temperature of hot water delivered to a whole building or a section of building. Sizes Inlet X Outlet: 1/2" X 3/4", 3/4" X 3/4", 3/4" X 1", 1" X 1-1/4", 1-1/4" X 1-1/2" and 1-1/2" X 2"
Approvals The Masterguard® Series is certified to ASSE 1017 and CSA B125.3, and is listed by ASSE and IAPMO. Fast acting, high quality thermostatic elements that sense the outlet temperature and react to maintain a stable delivery temperature even under varying and extremely low flows. 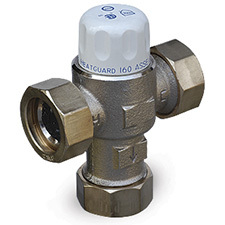 The Masterguard® Series features a range of six high flow rate valves that mix hot water with cold water to deliver water at a controlled temperature, typically 120°F (49°C). The adjusting handle can be locked at a desired temperature. 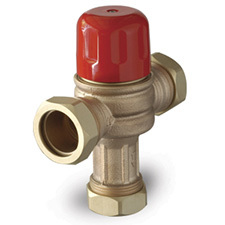 Each valve has integral mounting feet to allow it to be securely fixed to a wall or frame. Complete with 4 in 1 service fittings on each inlet. Every valve is factory tested. Applications Commercial and industrial plant rooms requiring limited access to system controls. Sizes Inlet X Outlet: 1/2" X 3/4", 3/4" X 3/4", 3/4" X 1", 1" X 1-1/4"
Approvals The Masterguard® Series is certified to ASSE 1017 and CSA B125, and is listed by ASSE and IAPMO. 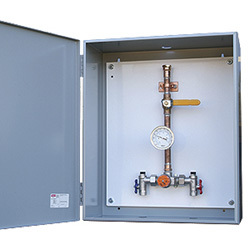 Each cabinet assembly is made to order and includes a Masterguard Series 800 valve as described above, integrated with additional components to meet your requirements. The robustly designed cabinet provides a secure, lockable encloser for the water temperature master controller. Applications For use with Heatguard® thermostatic mixing valves. Comes with 3 CTS tailpieces. 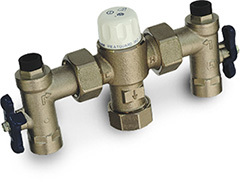 The kit aids in the fast and easy installation of a thermostatic mixing valve in a domestic water distribution system. 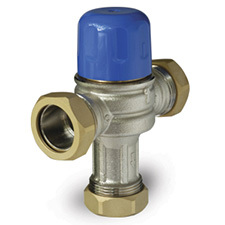 Use with SharkBite® Push-Fit fittings to easily connect a Heatguard® valve to 1/2" or 3/4" pipe. Heatguard® 110-D purchased separately. 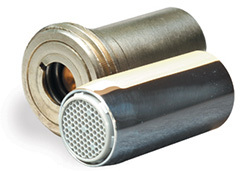 Applications Connection or adaptation of Heatguard® valves to various pipe systems. Sizes Available in several configurations which may include: Threaded, Sweat, CPVC, Barb, PEX and Compression. Use with Heatguard® 110, 160 and 115 base valves. 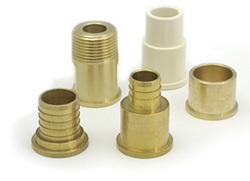 Each kit includes three union nuts and face seals, plus three fittings for a specific type connection. Available in sweat, barb/PEX, compression, threaded (NPT), and CPVC. All kits are available with check. 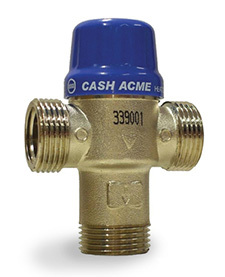 Cash Acme's Heatguard® Tank Booster combines a Heatguard Thermostatic Valve, a Flexible Connector and a Water Heater Tee in one package. The thermostatic valve is factory set at 120°F (49°C), but may be easily adjusted. 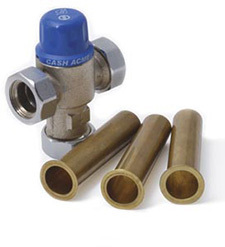 Use with SharkBite® Flexible Water Heater Connectors for easy installation in systems using copper, CPVC or PEX tubing. No need for additional transition fittings. Use in residential and commercial applications to control the temperature of distributed hot water.